In this new, thought-provoking talk, you will uncover the hidden opportunities across our largest environmental problem areas. By reviewing the construction issues around the Suburbs, Las Vegas, and New Orleans, you'll see the world in a new way. Drawn from the most advanced research in Green Building, this provides you with a roadmap for our buildings for the next 50 years. 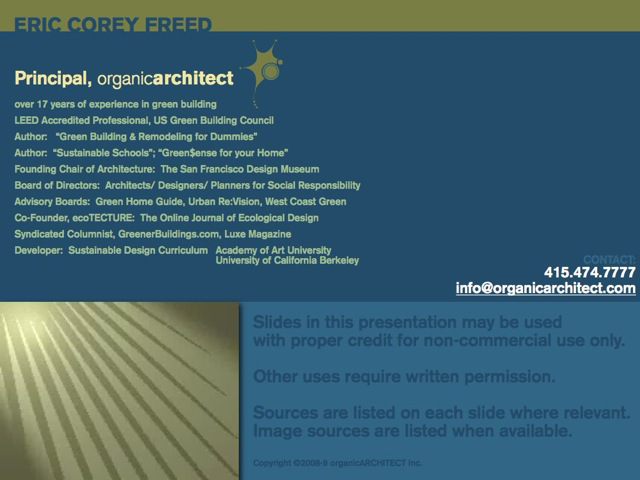 Using rich graphics, multimedia and never before seen research, this seminar will change your view of green building. This talk will only be presented in 2009. As the visionary founder of LivingHomes, the award-winning prefabricated homes that combine world-class architecture with an unparalleled commitment to healthy and sustainable construction, Steve Glenn has become a leading voice within the sustainable building movement. The developer of the nation’s first LEED Platinum home, and with over nine LivingHomes in development that are designed to achieve LEED Platinum, Glenn is one of the more experienced builders of environmentally conscious homes in the United States. While LivingHomes uses the LEED program for external review and validation, the company has established its own Z6 sustainable building goals, which serve as development objectives for each LivingHome, insuring that they have as close as possible to zero negative impact on health and environment. The Z6 goals are Zero Water, Zero Energy, Zero Waste, Zero Emissions, Zero Carbon and Zero Ignorance. Glenn will share his experiences working with leading architects, including Ray Kappe, FAIA, one the most celebrated modern architects in the US, and KieranTimberlake, the AIA 2009 Firm of the Year, to create LivingHomes. He will discuss the specific elements that go into a LivingHome to achieve the Z6 goals and the process of building a LivingHome - from its factory construction to on-site installation in mere hours. Attendees will gain new insights into sustainable design and prefabrication, and will be able to get any questions answered about building a LivingHome. This webinar will explain the importance of plants to our well-being and to the environments in which we work i.e. buildings. They are an essential part of any sustainability programme. The webinar will explain why every building should have plants on, in and around them And how these can contribute to the UK Government's Happiness Index and their targets to reduce absenteeism. In this 45 minute Webinar, experts from the energy efficiency industry will discuss building commissioning for both new and existing buildings. Martha Brook from the California Energy Commission will provide an overview of policies related to building commissioning. Reinhard Seidl, Taylor Engineering, will speak on the commissioning process, operational practices, tools and strategies utilized in the marketplace. Lia Webster, PECI, will moderate the session and cover project costs, programs and incentives, and energy and cost benefits from commissioning. This May, 210 employees at NASA Ames, Moffet Field will move into the Research Center’s first newly built facility in 20 years. The building and surrounding landscape nicknamed NASA’s Sustainability Base (a take on the Lunar Base) was designed to improve workplace effectiveness by maximizing daylight and fresh air and extensive water re-use. The result is a facility designed for near-net zero consumption for both energy and potable water. In addition to readily available products, the building will be outfitted with the latest NASA diagnostic and intelligence gathering devices to ensure the optimized long-term resource management. Sustainability Base and its connection back into the existing campus-wide building management system announces a new generation of "smart" infrastructure and integrated computerized system technologies which utilize adaptive intelligence applied to local climate. Understanding our local environment, monitoring and fine-tuning our resource allocation are paramount. What can technologies tell us about ourselves? What technologies are available? How can we enhance our existing building stock and prepare for a wide regional resource management strategy? How can we design smarter buildings and smarter infrastructure? Green building is growing exponentially as the federal government and major cities like Chicago and Seattle join private owners in requiring new buildings to meet stringent sustainability benchmarks like the U.S. Green Building Council's Leadership in Energy and Environmental Design (LEED) criteria. To meet this surge in demand, architects are employing not only proven clean technologies like wind and solar power, but new ones including nanotechnology, biotechnology and other emerging technologies. The convergence of green building and clean technology is creating not only significant improvements in human and environmental health, but major economic opportunities as well. Our panel of green building experts will provide insights into the costs, benefits and performance of the latest green building technologies. You'll learn about new green building technologies including insulating nanocoatings and aerogels, self-cleaning and depolluting materials, organic light-emitting diodes (OLEDs) and quantum dot lighting, organic thin-film solar cell technologies, and more. Finding a ‘green’ home or commercial building typically means evaluating the sustainable materials used in the structure and the energy footprint. But what about the toxic hazards that could be lurking under your property? There are numerous environmental characteristics that can exist within your property, or adjacent properties, some of which could wash the green right off of your low-energy, LEED-certified building! What’s more, if you’re looking for financing, you should know that lenders, in the wake of the real estate downturn, are placing a great deal of emphasis on factors like environmental contamination that can negatively affect a property’s value and potentially expose them to liability. Join us for this informative session that will help you to understand the importance of environmental due diligence in your quest for finding a green property. Major projects require huge levels of inter-agency co-operation. Different parcels are designed by different teams and developed by different contractors. How can you simultaneously achieve a green solution, cut costs and ensure consistency between the various elements on such projects? Using examples including the London Olympics and King Abdullah Financial District in Saudi Arabia, this presentation will show how it can be achieved. The European Federation of Interior Landscape Groups (eFIG) Chairman Thomas Palfreyman presents on the importance of plants in green building and urban design using case studies to highlight the benefits of plant life. Looking to 2050, the IEA has projected scenarios with various carbon reduction levels, where the “Blue Map” scenario achieves carbon stabilization levels. The carbon abatement cost curve depicts costs versus carbon abated for a rank ordered set of abatement strategies. A carbon cost of $300/ton for all aggregated sectors will bring about the Blue Map result. However, these scenarios estimate the total cost to society, total investments, less costs and savings, not considering who pays the costs and who benefits. The analysis implicitly suggests that the lowest negative cost options will happen, thereby paying for more costly abatement measures, e.g. Improved insulation results in a net negative carbon abatement cost, which could pay for implementing a more costly renewable energy supply. A misunderstanding of the carbon abatement curve interprets it as defining the carbon price needed to meet the stated efficiency levels. Rather, we find substantial price insensitivity to carbon and correspondingly, higher carbon prices are needed to influence building sector decision making for energy efficiency measures. To determine this, the WBCSD Energy Efficiency in Buildings project (EEB project) created a model of building stock turnover to compute energy efficient technology adoption levels based on micro-economic investor stakeholder decisions. Rather than an unacceptably high market carbon price to foster change, we found that only a set of aggressive policy measures implemented together to influence decision making would bring building sector transformation to the levels needed. Since 2005 Christian is Director of the Energy Efficiency in Building Project (EEB) at the WBCSD. He is part of the GEA and member of the KM on Buildings. He is also Project Director of the WBCSD/ UII – Urban Infrastructure Initiative. GreenFinanceSF is a property assessed clean energy (PACE) program launched in San Francisco on March1, 2010. The program will enable private property owners to finance energy efficiency, water efficiency and renewable energy projects on residential and commercial properties in San Francisco. If approved for financing, property owners will receive funds from the City for the upfront cost of projects and agree to repay the cost of the project plus interest as an additional line item on their property tax bill for the “life” of the financed improvements (up to 20 years). If the property is sold, both the property improvements and the remaining debt stay with the property and are passed on to the new owner. This presentation will cover the basics of the program design, including how GreenFinanceSF will help the City meet its carbon reduction goals; a general overview of the program; eligible measures and owner requirements; contractor qualifications and QA/QC issues; outreach and marketing, and other issues. Adobe - LEED and Beyond, a case study at Adobe Systems based on their LEED Platinum office building and recent incorporation of wind power. Hear from the General Manager at Ghirardelli Square & Development Representative for Fairmont Heritage Place and the experts who help her developing this cost-saving sustainability program. My research focuses on linking urban and landscape design with applied ecological research to study, adapt, and reshape human settlements in response to pressing sustainability challenges. The goal of this work is to bridge the fields of urban ecology and ecological urban design by implementing projects that include observable and testable phenomena. Melissa Farling, Brian Farling & Eddie Jones, Jones Studio, Inc. Designed as a cultural connection, rather than a division, the Mariposa Land Port of Entry is a major expansion of Arizona’s largest commercial Port of Entry. This port processes more vehicles than the JFK and LAX airports process planes…combined! Integral to the complex function and movement of trucks, buses, cars and pedestrians, a “desert oasis” assures a secure, safe, and yet sustaining and uplifting experience. Jones Studio will discuss the design for this Platinum track project. The design concept focused on fully integrating the security and safety necessary on the project with specific design strategies such as natural daylighting, water harvesting, photovoltaics, as well as broader sustainable concepts such as creating “oasis” spaces free from stress for officers and visitors. In 2009, the stock of LEED certified square footage in San Francisco increased 5-fold to 16.8 million LEED certified square feet as of December 1. Existing Buildings account for 75 percent this local LEED certified square footage, including properties ranging from the iconic Pyramid to historic 601 Townsend St. Transit density, requirements for recycling and water efficiency, and incentives from SF Energy Watch and PG&E, all contribute to a revolution in both commercial and government-managed facilities in The City. Learn how San Francisco is nurturing and pushing a resource efficient, healthy, and cost-effective built environment. The talk will feature the results of Mayor Newsom’s Task Force on Existing Commercial Buildings, which charts the path to dramatic acceleration of energy efficiency investment and improvements through an integrated strategy of financing, transparency, education, and civic leadership. level. This program is a overview of the new LEED 2009 rating system and the USGBC and GBCI's new professional accreditation program. Participants will gain an understanding of the intent, strategy, and structure of LEED 2009. Participants will also gain insight into how LEED 2009 will impact their projects, how to communicate these changes to clients, and how the new accreditation and maintenance program impacts current and future LEED-APs. Green Building Services led the authorship of the LEED 2009 Rating Systems and USGBC Exam Prep Study Guides. Over the past two years, the green product race has revved up in intensity. Every day, new products hit the market claiming to be green. But, inarguably, there are varying degrees of greenness. It is sometimes incredibly difficult to understand the atomic intricacies of some green products, and the move towards nanotechnology will likely further complicate a comprehensive understanding for most of us. But you don’t have to have a Ph.D. in chemistry or biotechnology to make your own sound judgement on the materials you select for your projects. A system that favors products which reuse, reclaim, recycle, renew, reduce, and rethink material sources will help you make intelligent sustainable material selections. This session proposes a two-pronged approach to building your own green materials library: establish a comprehensive and meticulous material evaluation system, and develop a dynamic and industrious green network. In addition to providing an in-depth material selection criterion, it will showcase some of the newest green materials released, suggest strategies for ferreting the most innovative R&D and finding leading-edge sustainable material manufacturers, and provide tips for how to work with these companies to develop materials as of yet unimagined. Buildings must accommodate myriad requirements while having less environmental impact and providing useful space for working and living. You will hear best practice tips and techniques for building practical and efficient structures as well as the latest trends in emerging areas including green building, retrofitting, LEED, sustainable materials, design software, and more.